There are gadgets, and then there are gadgets. And we could write about this Multi-Function Tape Measure in italics all day long. You see, most tape measures stop at just one function: Measuring. And we all think that's OK because, so far, it has been OK. We've been living our OK lives in our OK houses with our OK toolboxes without ever considering that there might be something out there that's better than just OK.
Then the $17 Multi-Function Tape Measure upped the ante in a big way. 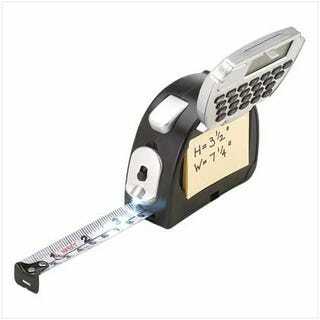 It added a calculator and sticky notes for managing your measurement data. And then it shoved in an LED flashlight to top things off.